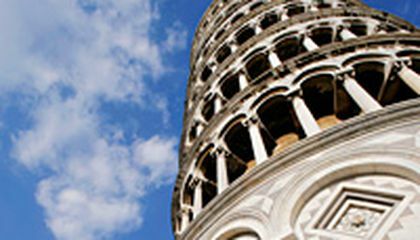 You asked us, When will the leaning tower of Pisa fall over? Pretty much since the first stone was laid, the tower of Pisa in Italy has been a Keystone Kops version of architecture. Not long after construction began in 1173, when builders reached the third story, the thing began to tilt. Theyd cleverly built it on a foundation of mud, sand and clay. But it was kind of like quicksand, basically. It took hundreds of years of fits and starts to complete the building. Architects tried columns of different heights to even out the lean which of course made things worse. And giving the tower a bit of an interesting, how should we say, banana shape. As late as 1935, engineers managed to do exactly the wrong thing to try to shore up the tower. By the 1990s, it was tilting 5.5 degrees to the south. That was just past the point at which it was supposed to collapse catastrophically. 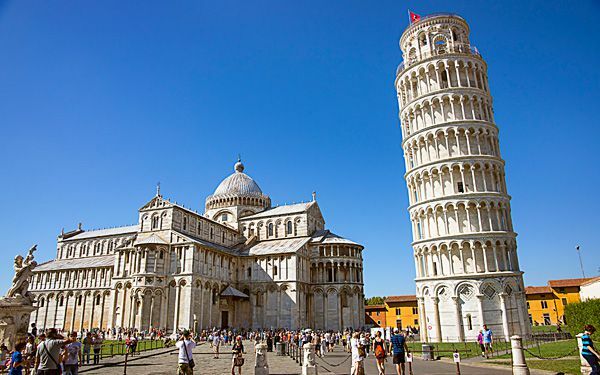 Finally, someone figured out that it might help to just gently remove some of the soil from under the north side of the building, away from the list and lo and behold if the good ship Pisa didnt start to right itself. Now listing at a comfortable and picturesque 4 degrees, the tower is in no immediate risk of toppling. Unless theres a massive earthquake or giant or tornado or meteorite or something. Critical thinking challenge: The author compares the tower to the shape of a banana. Which other objects have a similar shape? The Leaning Tower of Pisa has always been interesting to my well just geography in general. I had never knew that the Leaning Tower of Pisa was tilted at a 5.5 degree. I'm thrilled that the fixed it so that many more people can visit this beautiful structure and I hope it stay just how it is. I think this is cool because someone figured out a way to decrease the lean the tower was leaning. The tower was leaning 5.5 degrees but luckily someone suggested to remove soil from the north side and then the tower leaned 4 degrees. It was amazing because the tower did not collapse. Answer: A stick has a similar shape because it can lean against something. A straw has a similar shape too because it leans against the cup. I think the Leaning Tower of Pisa will not fall until someone might drive a plane, car, or a motorcycle strait into the tower.